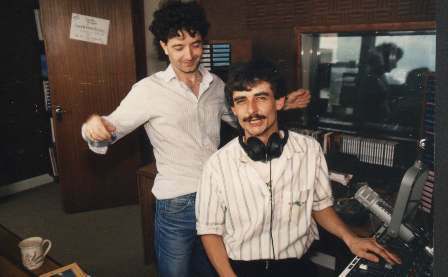 KISS FM was thought to have been borne out of an original station which operated in the North of Ireland in 1985. 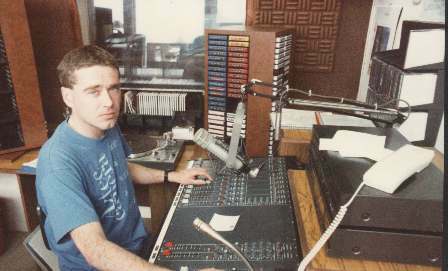 This early version of KISS FM had broadcast to the Craigavon area, and in around March 1985 began operating a seven day schedule. Unfortunately the British DTI did not let it last too long and it was raided shortly afterwards with much publicity. Later in the year, a local newspaper article (including a photograph of Dennis Murray), announced that KISS FM would be starting a TV service, although whether this came on the air is not known. Plans were then hatched to open a station South of the border with the aim of covering Belfast with a saleable signal. To give the required coverage, high powered transmitters would be required. Probably the first of the high power FM stations believed to involve the old KISS FM staff, was ZEE 103. This station broadcast from Omeath in County Louth, beginning in late 1986, on 103.25kHz using a 3kW transmitter and an antenna system pointing North. It gave a good signal into Ulster, and could even be heard on the West coast of England. Unfortunately, although the signal could be heard in the lucrative Belfast market, it was not really strong enough to attract the 'normal' listener, and thus advertising. Zee 103 continued to operate successfully in the County Louth and Armagh area until it closed in December 1988. In 1987 work was done in looking for a better site to hit Belfast. Eventually a location in County Monaghan was found, on a mountain a short distance over the border. From here there was line of sight to Belfast. This was the beginning of KISS 103.7 FM. 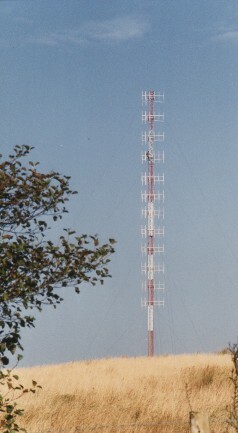 A 200 foot high mast was erected (see photograph left) at the mountain site, and FM transmitters of 5kW and 1kW were installed in a container at the foot of the mast. A Medium Wave site was found just North of Monaghan Town, and two transmitters of 5kW and 1kW were purchased for this site. Initial test transmissions on 103.7MHz FM were heard in early December 1987. These early tests were of continuous music and low power of 100 watts with no audio processing. Later in December a few announcements could be heard. (Click on real audio (680k) or mp3 (2.7MB) for airchecks of these tests on 21st December.). MW and higher power FM tests were awaiting the installation of three phase supplies at the sites. Whilst work was being done at the transmitter sites, studios were set up in Monaghan Town. 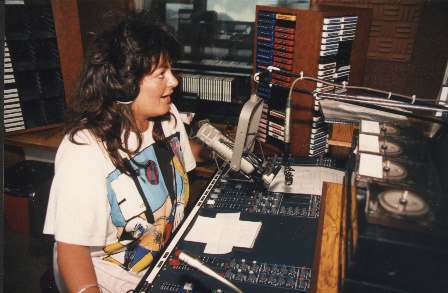 Higher power FM tests began in January 1988, but high winds damaged the mast in early February, and the station was off the air for several days. Only 30 feet of the mast were recoverable, and the station came back with a reduced signal. Late February saw the three phase supply finally installed, and shortly after this, a little later than was hoped, full test transmissions were being broadcast on 1008kHz Medium Wave, and 103.7MHz FM in stereo in parallel. The AM signal was omni-directional giving good results, especially in its expected coverage area to the North East. Another station in County Monaghan, Northern Star, operated on 999kHz, the next channel to KISS FM. They moved up the band to 1116kHz to avoid KISS FM once tests had started. Announcements were given out on KISS FM, telling Northern Star listeners to retune to 1116kHz to find their station. Early March saw full test announcements. (Click on the appropriate link to hear 3 extracts of the test announcements as recorded in Western Scotland on Thursday 24th March 1988. Listen in Real Audio format clip1 (800k), clip2 (50k), clip3 (100k) or mp3 format clip1 (2800k), clip2 (185k), clip3 (365k).) However it wasn't until 11am on Sunday 27th March 1988 that full official transmissions began with a one hour special involving all the station staff. Problems occurred the next day, Monday when the station had to close in the afternoon due to a severe hum caused by an ESB electrical supply problem. It was Thursday before both channels resumed broadcasts. The station presenters during the first week included Nick Richards (0600-1000), Tom Hardy (station manager - see photo right)(1000-1400), Owen Barry (1400-1800) and John Friday (1900-2400). Through the night was on tape, and at the weekend some other presenters could be heard including Dennis Murray, Roland Burke and Miles Johnston (the station engineer). On 24th April, the FM transmissions were finally on high power, following an aerial re-build, and the signal into Belfast was very strong. The FM aerial system was extremely directional and although the transmitter was 5kW, the ERP towards Belfast was initially several hundred kilowatts. It could also be heard on the West coast of England almost all the time, presumably from a side lobe. Station engineer Miles Johnston appeared on the Radio West (Mullingar) Anorak Show on Sunday 1st May and gave a rundown of the station. Not long after the official start of programming, the station began to hear of complaints from Downtown Radio, the ILR station in Belfast, who claimed that the signal on 1008kHz was interfering with their main transmissions on 1026kHz. At two channels away, and with the filtering at the 1008kHz transmitter, this should not have been the case, and was the beginning of a long running battle with Downtown throughout the rest of the life of KISS FM. In order not to aggravate the situation, KISS turned off its AM transmissions on 22nd June. After several days off the air, KISS re-appeared on 1170kHz with AM only tests, whilst normal programmes could be heard on FM. On Tuesday 29th June, a full relay of 103.7MHz began. 1170kHz was not a very clear channel but was the best of the few that were available - remembering of course that in 1988, the Medium Wave band was full of Irish free independent radio stations. Susan Charles (photograph left) joined the station on 26th June and could be heard on news and promotions. In late July further disaster struck, when in a freak storm, high winds blew the FM mast down. This left only the 1170kHz AM transmitter on the air, and for several days the station referred to itself as KISS AM. A number of sections of the collapsed mast were salvaged, and 103.7MHz returned to the air some days later with a reduced signal. It was eventually up to full power by mid August. The signal on 1170kHz was still causing some concern, as it was not penetrating as well as 1008kHz had. A new channel of 1413kHz was decided on, but this was already occupied by Big M Community Radio in Castleblaney. After several weeks, Big M agreed to move down the band to 864kHz. Finally on Monday 31st October, KISS FM could be finally heard with the 5kW transmitter on this channel, with the standby 1kW remaining on 1170kHz. The station continued on both channels for a while, announcing both frequencies. Being towards the top end of the Medium Wave band, this channel still did not carry as far as 1008kHz, but it was clearer at night and it did enable listeners in North West England and Western Scotland to tune in, as it was clear of any other local stations. Right: Nick Richards and Owen Barry having a laugh in the studio. There had been problems with the AM transmitter in early December, resulting in both periods of being off the air, and low power at times. The station managed to get 1413kHz back to high power only to go off the air a few days before Christmas. The AM channel returned on 28th December but the following day, Thursday 29th December 1988, the transmitter went off without warning around 2pm. It never returned, and for the final day of the station it was heard on 103.7MHz only. According to a spokesman at the time, the landlord of the AM site had asked for the next portion of the rent. As there was only one more day to go, it was not worth the payment, and the transmitter was switched off. In late December, announcements were aired about the proposed closure of the station due to legislation. To listen to a streamed version of the closedown, visit www.radiowaves.fm, or if bandwidth permits, download a mono mp3 copy of the final hour from dxarchive (28MB). 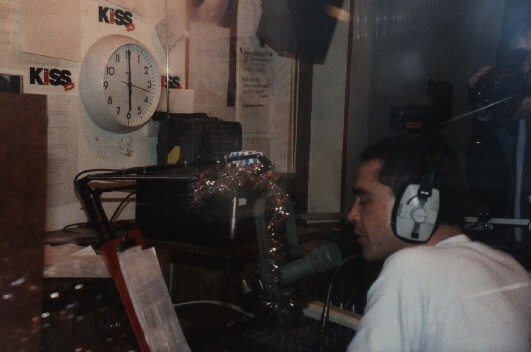 Tom Hardy Closes KISS FM for the final time at 6pm on Friday 30th December 1988.